Einstein meant it as consolation — he was speaking at the funeral of a friend — but alas, for André (Ted van Griethuysen) the distinction has melted and he is in terror. A man of great dignity and self-possession, Andrei finds himself facing some disconcerting uncertainties. Is he in his apartment, or his daughter Anne’s (Kate Eastwood Norris, or, sometimes, Erika Rose)? And who is that man (Daniel Harray or, sometimes, Manny Buckey) in the apartment with them? Why doesn’t his other daughter, Elise, come to visit them any more? And where is his damn watch? 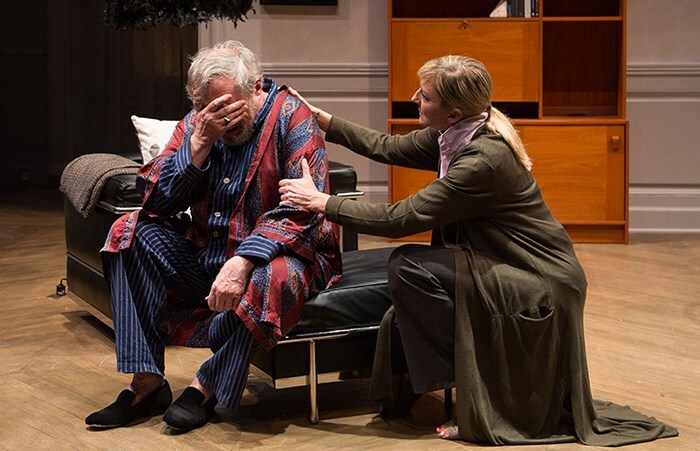 The Father comes to us as a comedy might: André, having terrorized his nurse into resigning, now must confront his daughter, who has a terrible dilemma. It is this: she is moving from Paris to London to be with her lover, and must find a solution for her father, who is slipping into dementia. She cannot look after him, and if she can’t find a caretaker she will have to have him committed. André, who has a robust sense of his own capability (if not a robust capability) doesn’t see what the fuss is about: he will care for himself, as he has for decades. He puts up defenses and evasions which are instantly identifiable to anyone who has coped with dementia, in any capacity. They all end up with and she stole my watch.